Exxon Mobil Corporation, the largest publicly-traded international oil and gas company, uses technology and innovation to help meet the world’s growing energy needs. Through its divisions and affiliated companies, ExxonMobil holds an industry-leading inventory of resources, is one of the world’s largest integrated refiners, marketers of petroleum products and chemical manufacturers. ExxonMobil Asia Pacific Pte Ltd is the regional headquarters for ExxonMobil’s Downstream and Chemical businesses in Singapore, which combined, employs more than 3,300 people. In Singapore, ExxonMobil owns and operates the Singapore Refinery and Singapore Chemical Plant. 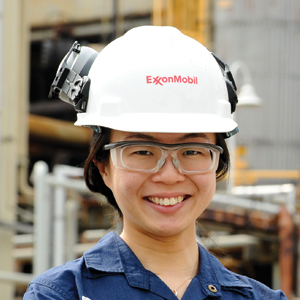 Together, they form ExxonMobil’s largest integrated manufacturing site in the world. ExxonMobil has operated in Singapore for more than 120 years, as we expanded from trading kerosene to having a multi-billion-dollar manufacturing and marketing presence today. In 2013, we completed the building of a diesel hydrotreater at the refinery to increase production capacity of ultra-low sulphur diesel fuel to help meet increasing demand in the Asia Pacific region. Additionally, we have a lubricant basestock manufacturing plant, and a lubricant plant, that supply the growing Asia Pacific demand. We also have an extensive network of service stations under the Esso brand and supply cylinder cooking gas to many households in Singapore. ExxonMobil is committed to addressing the challenge for sustainability – balancing economic growth, social development and environmental protection – so that future generations are not compromised by actions taken today. ExxonMobil’s approach to business and corporate citizenship is built upon a commitment to integrity in everything we do. Integrity is a commitment to do the right thing, the right way, every time – from business operations and technical challenges to the way we manage our business partnerships and engage our stakeholders. Geok Meng graduated with a Bachelor of Engineering in Chemical Engineering at National University of Singapore (NUS). 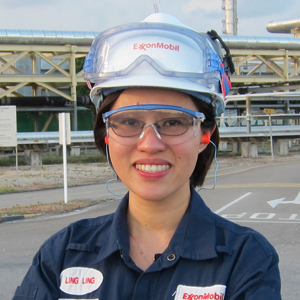 Connect with ExxonMobil Asia Pacific Pte. Ltd.